I really like the Christian Dior Haute Couture Spring Summer 2011. The full skirt dresses inspired by the fifties have the advantage of being flattering on any silhouette. I especially enjoy the shadings of shimmering colors like this dress with round shapes that is shaded gray-blue to sky-blue. 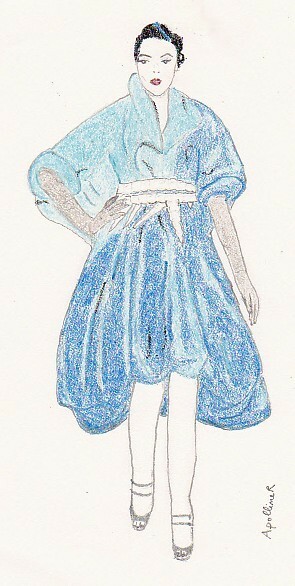 The second dress I have drawn is a pale-yellow strapless dress with white embroidery. The dress is tutu-shaped thanks to a superposition of tulle petticoats. You can see the whole fashion show of princess dresses on Vogue and Fashionologie. websites.